So you’re stuck inside on a rainy weekend with nothing to do. Why not play a board game? They are fun, time consuming, competitive, and bring friends and family together. If you are looking for something new and refreshing, even though it is a 10 year old game, try the Settlers of Catan. 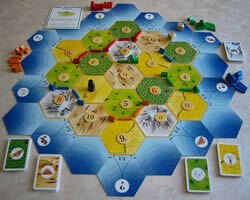 The players in the game try to establish a colony on the island of Catan. The island itself is laid out randomly at the beginning of each game from hexagonal tiles of different land types each producing one type of resource: ore, grain, wool, lumber, or brick. One hex is desert which does not produce anything. Each settlement can receive resources for its adjacent hexes. The resources, represented by cards, can be used to build more roads, towns, or cities, and to obtain development cards for later use. The building of a road, city, or settlement requires payment with a pre-established variety of cards. For example, a road costs one lumber and one brick card. When a player throws the dice, other players receive cards if they have a city or settlement occupying the hex with the same number as the dice. Players are allowed to trade among each other the resources they have produced, and to trade “off the island” for a hefty price. Player interaction is further complicated by the presence of a robber, which is used to steal from other players and hinder their production of resources. Various achievements, such as building a town or establishing the longest road, grant a player one or more victory points. The winner is the first player to accumulate ten victory points on his turn. The game only allows for a maximum of 4 players, but an expansion pack is available to purchase allowing 6 players to play. Settlers of Catan has won the game of the year in Germany in 1995 and United States in 1996. It was recently voted into the Gamers Magazine Hall of Fame in 2005.